Can Babies Get Hives From Teething? Teething is an uncomfortable condition that babies experience when their teeth start to break through their gums. Many symptoms are common with teething, but hives is not generally associated with the condition. However, your baby might have hives at the same time that he is teething, but the cause is likely something else. If your baby suddenly begins to break out in hives, call his pediatrician for a diagnosis and treatment advice. 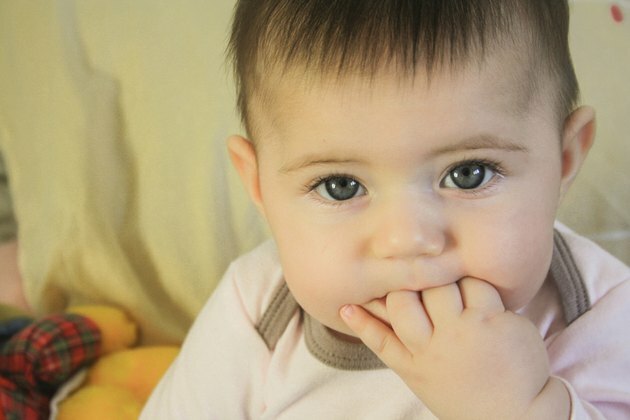 Teething symptoms vary in severity among babies and your infant might experience one or all of the principal symptoms. Biting or chewing, drooling, irritability, pain in the gums, difficulty sleeping and loss of appetite are common symptoms of teething. Some parents report a low-grade fever with teething, but many doctors say that symptom stems from an infection, according to Baby Center. Hives might appear while a baby is teething, but hives are not a recognized symptom of teething. Hives are a that occur when your baby's body releases histamine. They are caused by many conditions, including the presence of allergens, an illness, a sudden change in temperature, certain medications, or bug bites and stings. A hive is a raised, red and swollen bump and usually appears in groups. A case of hives is generally harmless, but if your baby exhibits difficulty breathing with them, get medical help immediately because he might be having an allergic reaction. Teething is not a condition that typically causes hives, but other changes in a baby's life at the same time might cause them to crop up, making many parents think they are a result of teething. Babies begin to get teeth between 4 and 7 months of age. During this period, most infants also begin to eat solid and table foods. Hives are a common symptom of a food allergy. If your baby has recently tried something new, she might be allergic to it. Food allergies can be dangerous, so talk to her doctor about testing. Babies who drool excessively as a result of teething might get a rash on their chin, especially if the saliva is not wiped off regularly. The rash isn't likely to be hives, but might look similar. If hives and teething occur at the same time, treating both will make your baby more comfortable. Offer him a cold or frozen teething toy or washcloth to chew on, which puts pressure on the gums while numbing them, alleviating pain. Infant pain relievers are another option, but should be used under a pediatrician's supervision. For a drool rash or hives, apply a topical cream that controls itching and helps heal the skin. Rule out any allergens that might be causing the hives, which allows you to keep your baby away from them. If you are ever concerned about either teething or hives, call your baby's doctor.